I like curry flavored anything. There is something about curry that makes you feel homey and comfortable. 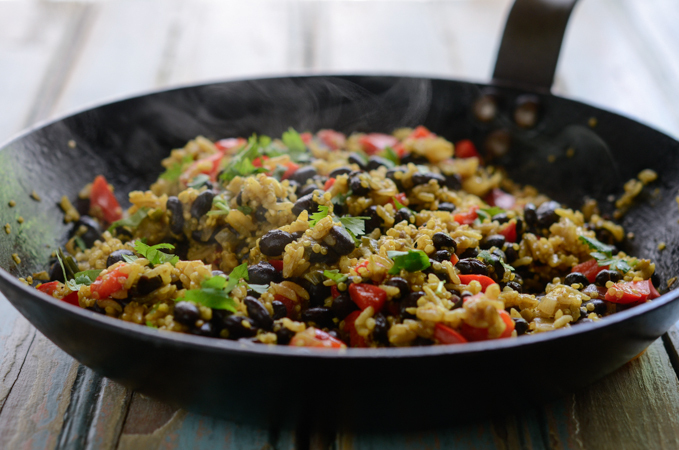 Here is a tasty and healthy quick side dish (or as a simple main dish) that is easily adaptable; Black Bean Quinoa Curry Rice! Sounds delish~, doesn’t it? This black bean quinoa curry rice is a gluten-free dish (as long as you use gluten-free stock) and can be adapted easily into a vegan dish if you switch from the chicken stock to vegetable stock. 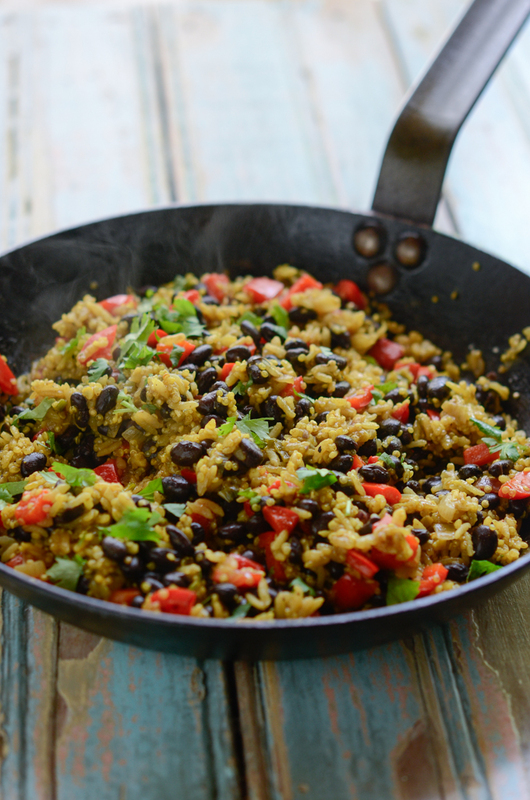 You can use all quinoa or all rice with black beans. I used half of each since I like them both very much. 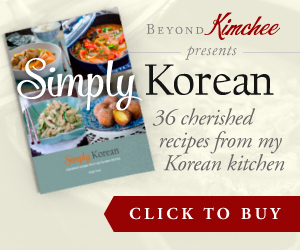 It is extremely easy and the outcome is so delicious and comforting. You can serve this as a light meal on its own, or as a side dish to any exotic feast. Of course I enjoyed it for my lunch and I loved every bite of it. I saute some red pepper, garlic, green onion in a little bit of olive oil to wilt them down. 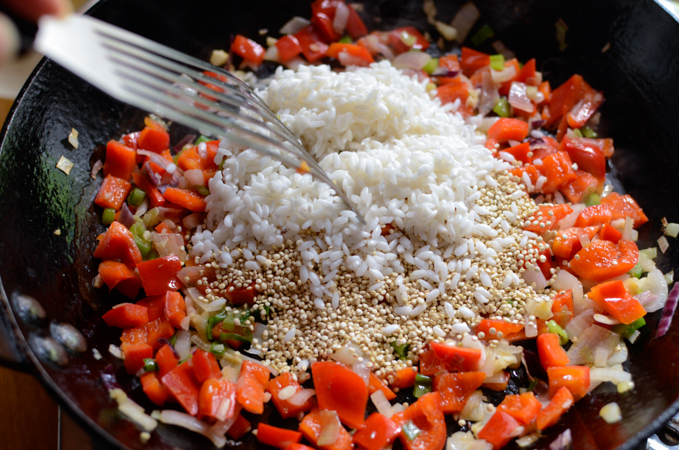 I would recommend to soak the rice and quinoa for 10 minutes before you add to the skillet. That will help you to use less stock and faster cooking time. Add chicken stock (or vegetable stock) and the spices. Stir and bring to a gentle boil, then cover and simmer over low heat for 15- 20 minutes until the rice and quinoa are tender. Stir them well to evenly incorporate everything in the skillet. Taste and season according to your taste. Oooooh~! 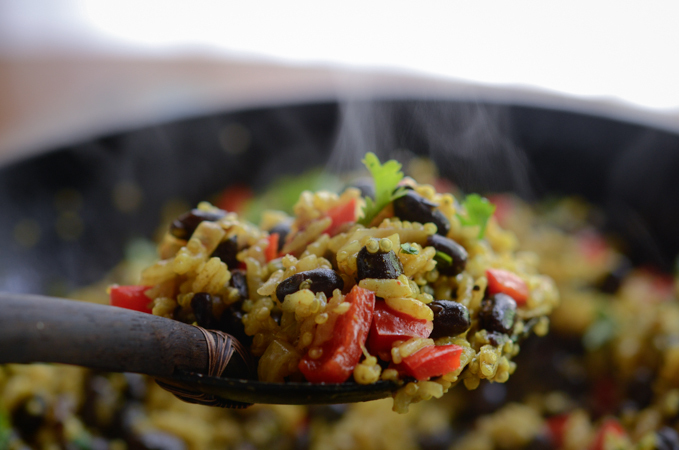 A spoonful of curry flavored rice and quinoa with black beans and vegetables? All the good stuff! I taking it in, babe! Throw some chopped cilantro for extra something. You know green makes thing more appetizing, right? I served myself a bowlful of it and that made me very, very happy. Can’t get any better. Yum! 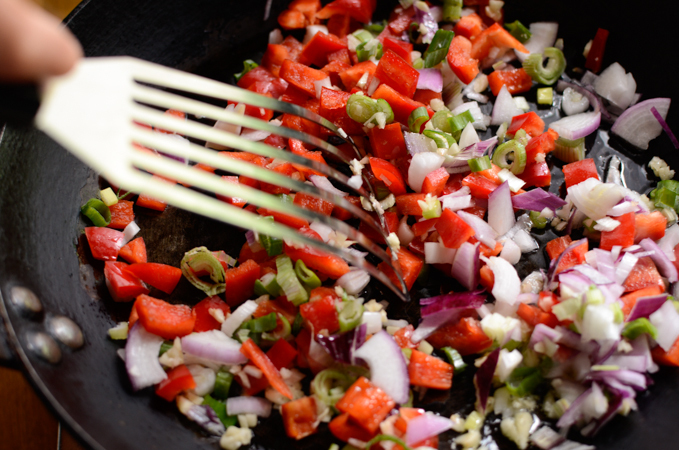 Heat oil in a large skillet over medium heat, cook green onion, red pepper, garlic until slightly soft, about 2 minutes. Add the rice, quinoa, and black beans, stir well. Add the stock and the spices to the mixture and bring it to a gentle boil. 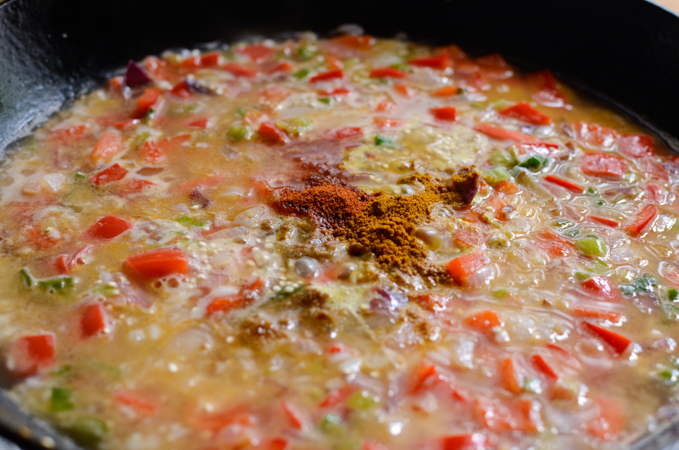 Reduce the heat to low and cover, simmer for 15-20 minutes or until the rice and quinoa are tender. When done, stir everything in the skillet and season with salt and pepper if needed. We're real curry fans, too. Never met a curry we didn't like! This looks fantastic -- something a bit different. Like this, a lot. Thanks. I love it very much and I make it quite often these days. So tasty! Curry + Black Beans? Check, please. 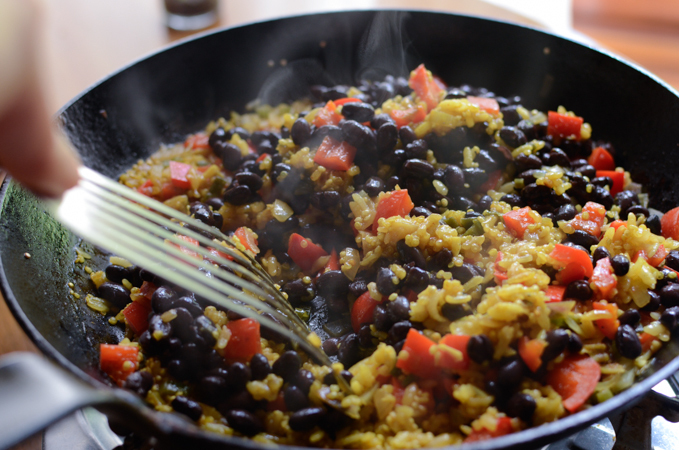 I'm Cuban so black beans are naturally a favorite of mine - adding them to a quinoa curry rice sounds like such a perfect idea. Need to try this asap! I'd love to try this recipe very soon. 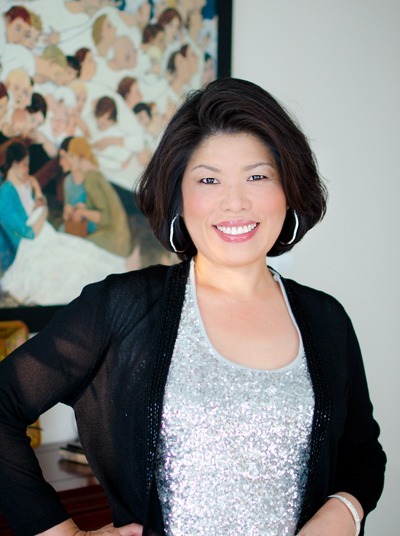 Do you use long grain or short grain rice? I used the short grain. You can use long grain as well. It is really tasty and simple curry rice to make. This was SO good! It tasted like rice pilaf and my boys loved it as a side dish and lunch leftovers the next day.